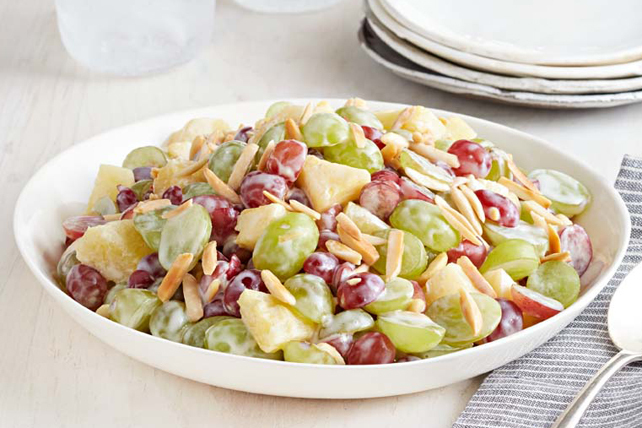 This isn't just any old fruit salad - our Creamy Grape Salad is full of fresh fruit flavour and great texture. Combine fruit and nuts in large bowl. Microwave cream cheese in microwaveable bowl on HIGH 20 to 30 sec. or until softened; whisk until creamy. Add sour cream and sugar; mix well. Add cream cheese mixture to fruit mixture; mix lightly. Prepare using 1 drained 398-mL can pineapple chunks in juice. This quick-and-easy fruit salad can be prepared ahead of time. Refrigerate up to 24 hours before serving.